You probably heard about the Marche en Fer, the Iron Market in Port-au-Prince Haiti, but did you know that Haiti's iron market was supposed to be a landmark in Cairo Egypt? 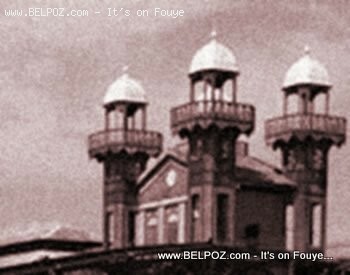 Yes... That's why Haiti's iron market looks like an Islamic mosque! Do you know why the iron market ended up in downtown Port-au-Prince Haiti instead of Cairo Egypt? There's so much we don't know about Haiti, perhaps this is why we do not appreciate it as much as we should. Like I always say, there is always a story to tell. These stories, when there are told over and over again, are the reasons we appreciate ourselves, our accomplishments as a people, our country, our city, our hometown, and our surroundings. They are the reasons why other people appreciate us, the reason why they would want to become tourists in our neck of the woods! Haiti's history is more complex than 1804, Dessalines, Petion, and Toussaint Louverture. Sometimes, we know so little about the history of Haiti, every little bit about her, that we take her for granted and we failed to appreciate her true meaning and what she stands for. It is sad to say that I drove all the way from New York to the state of Georgia, with a map in my hand, so that I could visit Stone Mountain and the house where Martin Luther King once lived. If it does, it is just another old house in Haiti where a poor family lives. Somebody will probably tear it down not knowing that it could have been a tourist destination generating millions of dollars for the city of Hinche Haiti. There are no gift shops in Hinche... and therefore no piece of history for a visitor of Hinche to take back home. As a nation, we have the tendency to see something and, because we don't know its history, we don't know how valuable it is, and we destroy it, we tear it down, not knowing it's true monumental value. We are a nation whose history is told verbally in most cases. The only written history we focus on seem to be about how we fought the French and got our independence. That's great but... Have we accomplished anything since? Of course we have but we have not been telling the story. I think it is time for each and every one of us to start digging a little deeper in our hometowns to find out who used to live in that old house instead of looking at it and say "Gad-on vye kay... kraze sa... bati yon kay beton la-a"
Do you think the Americans would tear down the little shack where George Washington was born? Let me tell you how the Iron Market found it's way to Haiti instead of Egypt. In 1889, the iron market's French-built minarets (distinctive architectural features of Islamic mosques) was to be sold to a strain station in Cairo, Egypt. The deal fell through and Haitian president Louis Mondestin Florvil Hyppolite purchased the massive iron structure and erected it in Port-au-Prince. It was part of his plan to modernize the Haitian capital. Unfortunately, President Florvil Hyppolite died of a heart attack before the end of his term as President of Haiti. I wonder what would become of Port-au-Prince had he served his full term in office. The iron market in Haiti stood tall in downtown Port-au-Prince for 119 years until 2008 when one side of it was destroyed by fire. 12 years later, on January 12, 2010, the Iron Market was completely destroyed by the earthquake. There is news that workers in Haiti are trying to restore the Haiti iron market back to it's original splendor. Let us hope it withstands the test of time once again and that it continues to be a landmark that our grand children can appreciate. « Preval's Last May 18, He Is Leaving As Planned! Hi, I'm a haitian living in Plano Texas. I left haiti very young and did not have the chance to learn much about my history. No there isn't an active Haitian community in New Zealand. You wouldn't know so though based on the support given to our country here in NZ after the January earthquake. wow that is so true "there is always a story to tell" as a Haitian I always want to learn about my country and other countries also cause I love history in general. Now I believe it's time for all of us to stand up to bring life to Haiti again. For that to happen we need to stop fighting to each of others, we need to stop talking bad about Haiti because Haiti itself is just a land. I hope I'm not talking out side the box, I hope what I write makes sense. That is true. Woodring is doing a wonderful job and I commend him for that. By the way Maya, is there an active Haitian community in New Zealand? I don't think I remember anything about president Hyppolite term while I was study Haiti's history. Thanks for enlightening me. Sure that was news to me. It's Maya Dorcil, Father of Manu Constantin and Ti-Maya. I'm an Haitian musician and producer from New zealand wanting to thank you for your immeasurable contribution to the "affairs of Haiti". I enjoyed reading your writing about our Iron Market's "lineage", story which was definitely news to me.